(Bloomberg) -- New York lawmakers are moving toward approving a $175.5 billion budget that includes tolls on cars entering midtown Manhattan, increases sales taxes on multimillion-dollar city homes and implements a statewide ban on single-use plastic bags. The budget agreement, struck by Governor Andrew Cuomo and legislative leaders over the weekend and debated through Monday morning in the legislature, would also cap local property-tax increases outside New York City at 2 percent a year, order sweeping changes to the Metropolitan Transportation Authority and scrap cash bail requirements that jails thousands a year before trial. 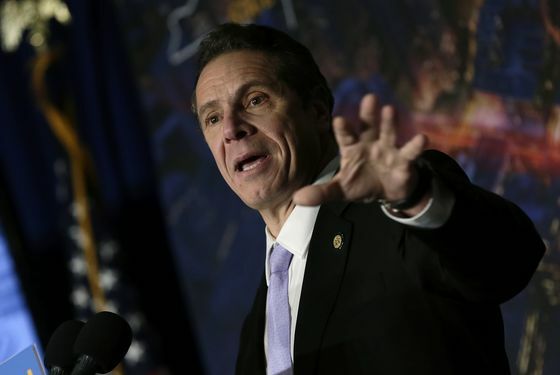 "This is probably the broadest, most sweeping state plan that we have done," Cuomo told reporters in Albany Sunday after legislative leaders agreed to the deal. "There are a number of national firsts and it really grapples with the tough issues that have been facing this state for a long time." Yet the governor and legislature failed to reach agreement on some key issues that were left out of the budget. Lawmakers remain bitterly divided about marijuana legalization, which Cuomo failed to push through after raising expectations of $1 billion in tax revenue for mass transit. They also punted on public financing of political campaigns, instead creating a commission to make rules on how and to whom the government should disburse tax dollars to candidates, saying their findings would be binding unless lawmakers vote to reject them. Congestion pricing isn’t slated to begin until the end of 2020, which may give its opponents time to launch a counter-attack. Officials still must determine how much drivers will pay to enter Manhattan south of 60th Street. Also left unanswered: which motorists might be exempt, and what break, if any, should Manhattan-bound suburban commuters get after paying stiff tolls for tunnels and bridges. While well-established in London, New York would be the first city in the U.S. to charge drivers for access. Congestion pricing is projected to raise $1 billion that would be used to pay debt service on $15 billion in bonds for New York’s Metropolitan Transportation Authority, which runs the city’s subways and buses and regional commuter rail lines. The plan received praise from groups as varied as the Environmental Defense Fund, the Regional Plan Association, the Real Estate Board of New York, Move NY, Uber and scores of other environmental, business, labor, transportation and civic organizations. Kathryn Wylde, president of the Partnership for New York City, a civic group of corporate chief executives, hailed the congestion pricing vote as “a breakthrough” for management of Manhattan traffic and mass transit. A study conducted for her group found Manhattan congestion costs the region $20 billion a year in delays and lost productivity. The so-called mansion tax establishes a new scale of graduated levies, starting at 1 percent, usually paid by the buyer, on all New York City apartments selling for $1 million or more. The rate then increases at $2 million and continues to rise until it reaches a top of 4.15 percent on $25 million. It’s expected to raise $365 million, money that would secure about $5 billion in bonds for mass transit. A previous mansion tax imposed a flat 1 percent rate on all apartments starting at $1 million. The state’s ban on disposable plastic grocery bags, forcing residents to pay for paper bags or re-use their own on grocery store visits starting March 2020, would reduce the 71,000 tons in plastic bags used annually just in New York City, according to the Citizens Budget Commission. The law also allows cities and counties to impose five-cent paper bag taxes, with revenue split so three cents goes to the Environmental Protection Fund and two cents to the municipality. Cuomo told reporters that he backed the plastic bag ban from his own personal revulsion.